In the event that we judge that it is unsafe e.g. risk of typhoons and lightning, high waves, strong wind etc., we may limit admission or ask people to leave early. In such cases (at the judgement of the organizer), if you cannot enter due to admission restrictions, we will provide refunds in accordance with the refund policy. Does the park close down when it rains? No, rain has basically no connection to the park’s operation. However, when there is some chance of lightning, we may close or temporarily close the park. What age must you be to enter the park? 6 years or older. In addition, 110 cm or greater height (roughly 3’7”) is required. Is it okay if our child can’t swim? Because we wear life jackets, no one sinks, but we cannot permit those who cannot swim to enter. A child at or below the age of 10 must be accompanied by an adult, but how many children allowed in per adult? We request that you bring only one child per adult (and that you always stay within eye shot of each other while inside the park). Where should we go to sign in? On the beach, there is a reception cabin (a white container house), so come visit us there. Does it cost any money just to watch from the beach? No, it does not cost any money. I just want to bathe in the water normally. Can I still enter the beach? Yes, of course you can enter. 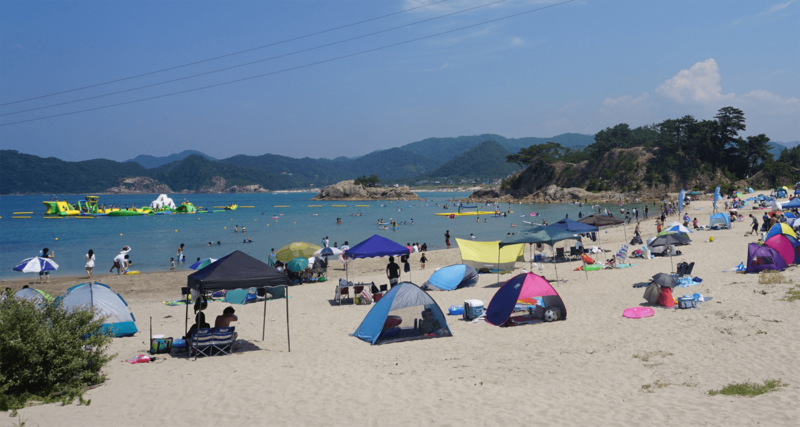 It is also operated as a normal beach. Are there rooms for showering and changing clothes? There are shower rooms nearby. Are there food and drink booths, etc.? At this park, we only sell beverages and ice cream. As for food, please make use of the beach houses and food and drink establishments nearby. Is there storage for baggage? It is possible for us to hold small items such as car keys at the reception area (on the condition that we cannot be held liable for them whatsoever), but we request that you manage any valuables and bags on your own. Are floats and beach tents available for rental? Yes, they are available (limited supply). About PassMarket web tickets: are QR codes shown for convenience store payment? Is it OK to bring beach tents into the park? Can we hold a barbecue? I’m from a country other than Japan. If I want to buy a ticket on the Internet, do I need a Japanese address or phone number? Note that English language input is not supported currently. But you can buy a ticket if you enter the address of your accommodation in Japan. We bought PassMarket tickets. If the purchaser bought tickets for ten people, and if, for example, two of those people wanted to cancel two days in advance, would it be possible to process the cancellation of just two tickets? Or would we need to cancel all of the tickets and go through the process of purchasing tickets again? You cannot do a partial cancellation. It will be necessary for you to do a complete cancellation and make another purchase. I think I want to buy advance tickets, but can I buy tickets for 2 consecutive hours? I applied for a ticket through convenience store payment with PassMarket, but I’ve gone over the three day payment deadline. What should I do? After the payment deadline (within three days), you cannot complete the transaction. It will be automatically canceled, so you will need to make another reservation. Isn't the contact number a private number? It is a mobile phone number, but it is an office line, not a private line. To customers who paid with credit card, if a charge is incurred despite cancellation, we had stated that "we would process a refund at a later date", but having checked this with Yahoo PassMarket, we note that there is a framework in place such that "the amount is automatically refunded to your credit card". We have thus made the following correction to our refund policy. However, due to circumstances such as credit card closing dates, a charge may be made once. Whether this occurs or not will depend on your particular credit card and its cut off dates etc. But despite some differences from case to case, a full refund will be given by the credit card company within the next month or so. Please be assured that a refund will be provided without fail. For example, after the cut off date, the amount for the ticket may be deducted from your bank account in the name of your credit card provider. The refund would then be reflected in your bill for the following month. If your usage for the following month is less than the refund amount, then the amount may be refunded to you from the credit card company. However, details regarding how the refund is made from your credit card provider e.g. when the refund will be made, whether it will simply be deducted from other usage items etc. can only be confirmed by card users. For more details, please contact your card provider directly. Customers who paid at a convenience store are not entitled to a refund, even when a cancellation is made by the organizers, as stated during booking. Groups may make purchases online in the same way as individuals, using the group name instead of a private name. Please state your group or organization name and purchase the required number of tickets.